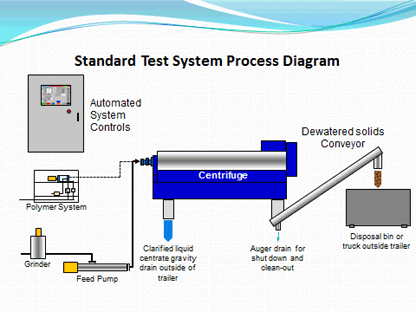 For onsite application testing Hiller-US in Lampasas, Texas maintains a range of fully equipped centrifuge pilot test unit. 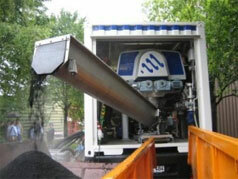 The portable system features a full-scale DP45 production model centrifuge mounted in full size semi-trailer with full automation and system controls plus ancillary equipment such as pumps, polymer systems, and sludge auger as well as connection hoses for a complete set-up. The typical one-week test program includes the services of a Hiller test technician who specifically evaluates the capacity of the centrifuge on a representative material. The purpose of this pilot study will be to investigate performance, provide operational data, and develop treatment experience with the centrifuge process. Test data is then summarized into a written report. Note: A polymer supplier will normally carry out jar tests to select the correct grade of polymer and dosage. Increasing the addition of polymer will usually improve the performance. It is however possible to overdose a system, which can prove detrimental to results, as well as wasting polymer. 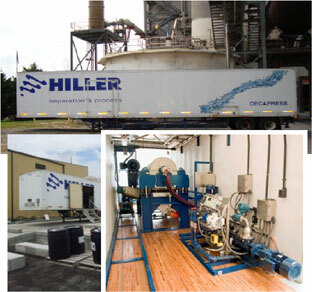 The Hiller Centrifuge Dewatering Pilot Trailer includes a DP45 solid bowl centrifuge, a polymer make-down unit, a feed pump, and a screw conveyor system for removal of the dewatered bio-solids and / or sludge cake. The low head, positive displacement feed pump receives solids from a storage tank or digester and conveys the material through a pipe to the centrifuge. Dilute polymer from the polymer make-down unit is injected directly into the feed chamber of the centrifuge through a feed tube. 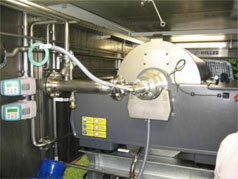 The centrifuge consists of a 316 stainless steel cylinder (bowl) with a conical section on one end. The cylindrical portion of the bowl is capped with a solid steel end plate and fitted with adjustable centrate weirs. The conical end of the bowl is fitted with wear resistant ports to allow dry solids to discharge after centrifugation. 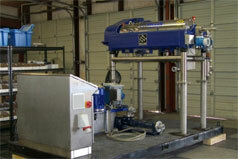 One (1) Stranco Polyblend polymer dilution system and progressive cavity dilute emulsion feed pump. Water: 35-gpm Note: only used intermittently for flush at startup and shutdown. Continuous flow for polymer makeup is less than 10-gpm. City water is requested. Hiller-US also has a test skid featuring a smaller DP26 decanter centrifuge fully equipped for conducting dewatering demonstrations and application testing. Ancillary equipment includes controls, pumps, polymer systems, and sludge auger as well as connection hoses for a complete set-up. Water: 20-gpm Note: only used intermittently for flush at startup and shutdown. 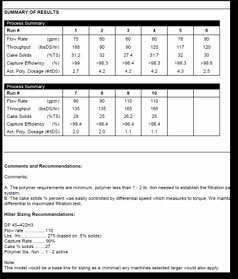 Continuous flow for polymer makeup is less than 5-gpm. City water is requested. And coming in November 2013 Hiller-US will add another portable test system featuring the all new energy efficient Hiller model DP484 with the revolutionary new Hiller SEE drive. SEE which stands for Stationary Energy Efficient drive incorporates a direct drive gearbox eliminating V belts. And as the name suggests this new centrifuge offers superior energy efficiency. The New Stationary Gearbox also incorporates a new oil circulation system which delivers cleaned filtered and cooled oil directly in to the main rotating parts of the gears leading to smooth operation, high torque, reduced wear and increased longevity. The SEE range of Hiller DecaPress centrifuges also come with the new Swiss built SEE controller which provides a processing speed some 4 x faster than previous systems and allows for Ethernet and Profibus communication all supplied as standard. The DP484 with SEE Drive will also be mounted in full size semi-trailer with full automation and system controls plus ancillary equipment such as pumps, polymer systems, and sludge auger as well as connection hoses for a complete set-up. 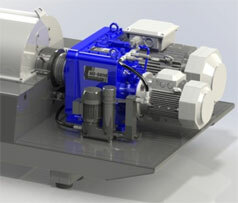 The new centrifuge saw its first production runs at a sewage treatment plant in Germany at the end of June 2011. During proving trials the unit was said to offer a 30% increase in production capacity compared to the conventional centrifuge at site and cake solids were some 5% points better. Polymer and power consumption was also said to be considerably lower than expected making this next generation machine an energy efficient winner for Hiller. Contact us for further information and details.